Mean annual temperature is approximately 6.6°C (summer: 20°C, winter: −8°C), and mean annual precipitation is approximately 1300 mm, distributed evenly throughout the year. The soils are Spodosols, developed on glacial till derived from granite and gneiss. Soils are well drained, acidic, and nutrient poor. Aspects across the forest are primarily north and east. Forest stands are 90-150 years in age and are dominated by the deciduous species Acer rubrum (red maple) and Fagus grandifolia (American beech), with lesser amounts of Acer saccharum (sugar maple), Betula papyrifera (paper birch) and Betula alleghaniensis (yellow birch). Conifers like Tsuga canadensis (eastern hemlock), Abies balsamea (balsam fir), and Pinus strobus (Eastern white pine) are also present in smaller amounts. This particular site was chosen as representative of soils, elevation, climate, and tree species composition typical of forested areas throughout New England and northern New York. 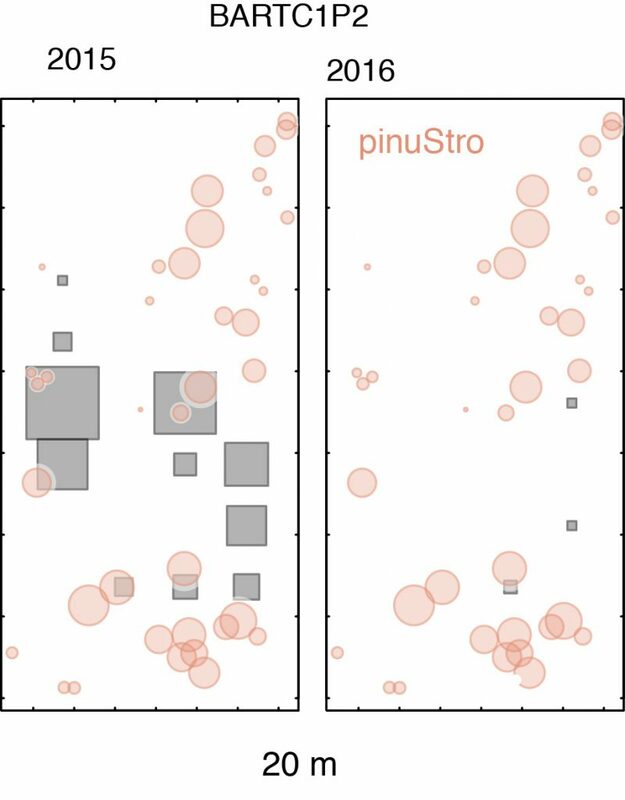 In 2012, Dietze Lab (Boston University) set up inventory plots in compartments C1 (lower elevation plots) and C38 (higher elevation plots). In each compartment, two closed canopy plots of ~1 ha were established (C1P1, C1P2, C38P1, C38P2). Since 2012, data collection has included seed rain and adult tree/sapling/seedling censuses. BART has active NEON and Ameriflux towers. Climate data come from the tower operated by Andrew Richardson. Pinus strobus in mast and non-mast years at BART-C1P1. Fer, I., Kelly, R., Moorcroft, P. R., Richardson, A. D., Cowdery, E. M., and Dietze, M. C. 2018. Linking big models to big data: efficient ecosystem model calibration through Bayesian model emulation, Biogeosciences, 15, 5801-5830. Lee, M. S., Hollinger, D. Y., Keenan, T. F., Ouimette, A. P., Ollinger, S. V., and Richardson, A. D. 2018. Model-based analysis of the impact of diffuse radiation on CO2 exchange in a tem- 65 perate deciduous forest, Agr. Forest Meteorol., 249, 377–389. Toda, M., Richardson, A. D. 2018. Estimation of plant area index and phenological transition dates from digital repeat photography and radiometric approaches in a hardwood forest in the Northeastern United States, Agr. Forest Meteorol., 249, 457-466.